A week of Good policies & Bad policies! Making a Difference for Entrepreneurs, the eighth in a series of annual reports published by IFC and the World Bank is a report to reckon with. The study conducted on the world’s economies gives ranking to countries after executing lot of calculations on various parameters on “ease of doing business”. The study is like report card for all the efforts put in by world’s economies covering the period June 2009 through May 2010. The various parameters considered were ease of starting a business, Dealing with court permits, registering properties, getting credit, protecting investors, paying taxes, trading across borders, enforcing contracts & Closing a business. Among the world economies Kazakhstan showed phenomenal change in rankings by improving conditions for starting a business, obtaining construction permits, protecting investors, and trading across borders. 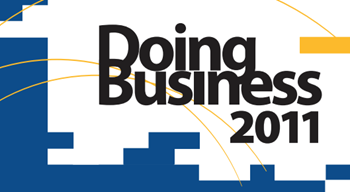 As a result, it moved up 15 places in the rankings on the ease of doing business—to 59 among 183 economies. Two other regional economies, Tajikistan and Hungary, were also among the 10 most-improved economies, climbing 10 places and six places respectively. This year’s list of the 10 most-improved economies includes three in Sub-Saharan Africa—Rwanda (a consistent reformer of business regulation), Cape Verde, and Zambia—as well as Peru, Vietnam, Grenada, and Brunei Darussalam. Globally, doing business remains easiest in the high-income economies of the Organization for Economic Co-Operation and Development and most difficult in Sub-Saharan Africa and South Asia. But developing economies are increasingly active. In the past year, 66 percent reformed business regulation, up from 34 percent six years earlier. In the past five years, about 85 percent of the world’s economies have made it easier for local entrepreneurs to operate, through 1,511 improvements to business regulation. Doing Business 2011 pioneers a new measure showing how much business regulation has changed in 174 economies since 2005. For the fifth year running, Singapore leads in the ease of doing business, followed by Hong Kong SAR China, New Zealand, the United Kingdom, and the United States. Among the top 25 economies, 18 made things even easier over the past year. Worldwide, more than half the regulatory changes recorded in the past year eased business start-up, trade, and the payment of taxes. Many of the improvements involve new technologies. Technology is an enabler which makes compliance easier, less costly, and more transparent. China and India are among the top 40 most-improved economies that made significant changes in business regulation at a steady pace in 2009 to make it easier for firms to operate, according to a new World Bank report. Though India comes in at number 134 out of the 183 (one rung higher than last year’s 135) it has a long way to go, since its counterparts are way ahead china stands at 79, Russia& Brazil at decent 123 & 127 respectively. Since 2005, India has implemented 18 business regulation reforms in seven areas, creating more opportunities for local firms, according to the report. Many of the reforms focused on technology-implementing electronic business registration, electronic filing for taxes, and online submission of customs forms and payments, and the report notes. Governments worldwide have been consistently taking steps to empower local entrepreneurs since entrepreneurs play quintessential role of a catalyst in today’s society in defining a promising future for society at large & nation on a whole. Private sector development and entrepreneurship development are crucial for social & economic development. Nations need to nurture and develop entrepreneurs to be able to take advantage of opportunities created by globalization. This report is testimony to the fact that today entrepreneurship is touted as the powerful growth engine of economic growth, job opportunities, wealth creation and improvising quality of standards for the society. Top 5 tips to name your business!